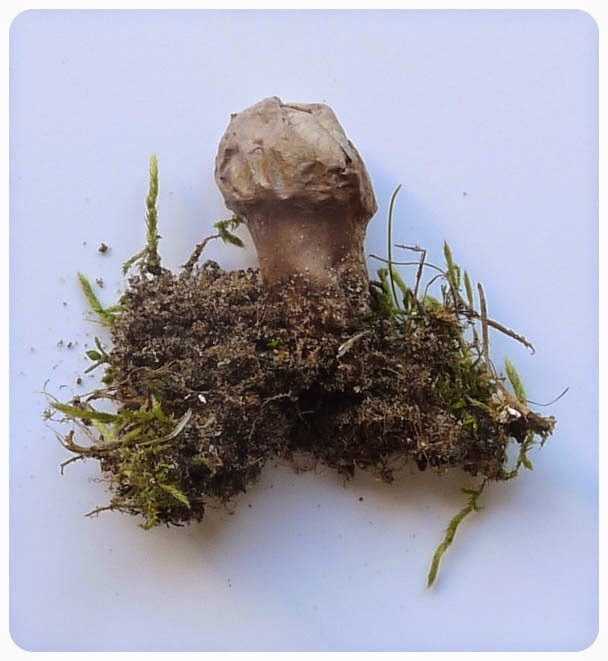 Carmarthenshire Fungi: Could this be Bovista limosa? Could this be Bovista limosa? 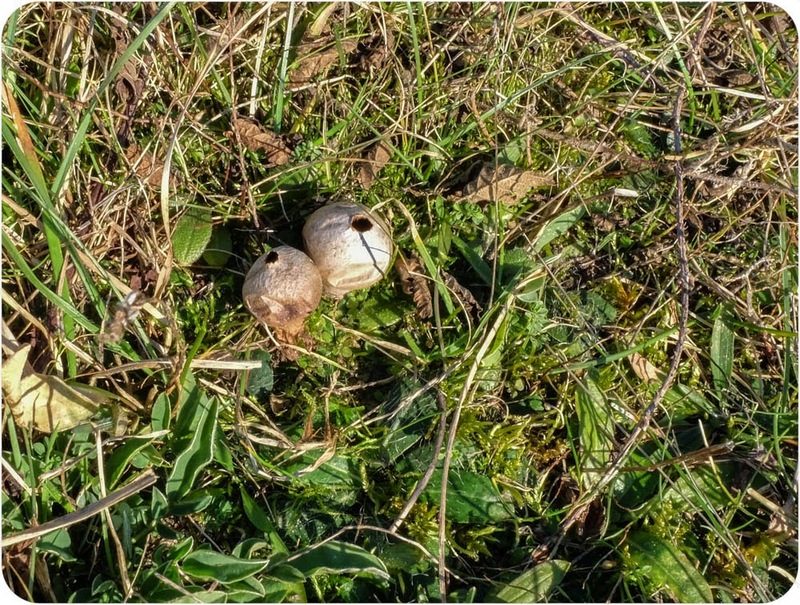 Took the dogs across Pembrey Burrows yesterday and came across these small puffballs ~ 1-2 cms across. They were firmly attached to the ground on little stalks unlike the b. plumbea. The fbs were pretty washed out but there were still plenty of spores inside. These were brown and spherical, measuring ~ 5um in diameter. They also had tiny tails and were covered in tiny warts which came out rather well in the spore-photo below. Are they the Lost and Found Bovistas that Philip asked us to look for Colin? If so, that didn't take long to find them. Good try - correct habitat -- but this is a nice 'puffball', Lycoperdon, rather than a 'bovista'. This is the Grassland Puffball, Lycoperdon lividum. This has a well delimited pseudostipe, 1-4 cm tall and 1-2.5 cm diam. 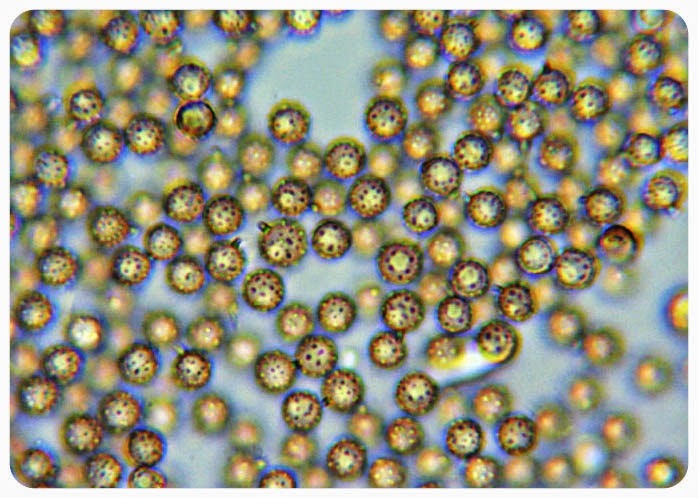 Spores just under 5µ diameter with tiny sterigmal remnant attached. Bovista limosa, Least Bovista, is smaller 5-15mm diam with no 'stem-like' base and soon free to roll about. Spore size is slightly larger but main difference is the long sterigmal remnant 3-10µ long. The Grassland Puffball is uncommon as small and in short grass, often coastal, a nice find but probably has been sitting there some months ---- so looks washed-out. Thanks Philip, thought it was too easy finding these elusive species!